Members of the Dundee Design Festival team in the Keiller Centre. The unusual surroundings of a city centre shopping mall will be home to this year’s Dundee Design Festival. The festival, which was launched after Dundee was named a UNESCO City of Design, has previously been held in the former print works at West Ward Works. The 2019 event, which runs from May 21 to 28, is moving to a new city centre home in the Keiller Centre. This year’s festival will ask participants to explore what makes cities more liveable and lovable. The festival will be produced by Dundee-based design studio Agency of None. Research for the festival began last year with an online survey that asked people about the cities in which they live. The responses have informed the three themes that will be examined during the week-long festival: redesigning and repurposing city centre spaces, empowering citizens and playing with the possibilities of change. Angus Morton, manager of the Keiller Centre said: “Here at the Keiller Centre we are delighted to be working with the team at Dundee Design Festival. It’s very exciting that the centre will be the venue for this year’s event. 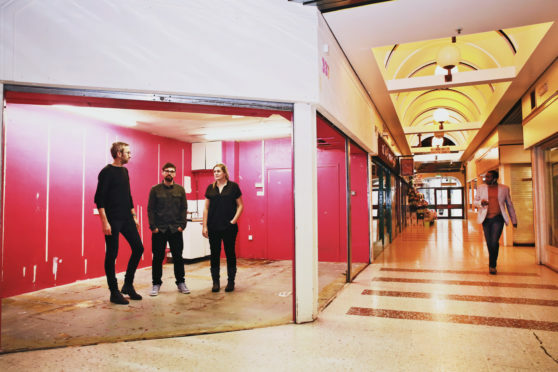 Dundee based design studio, Agency of None is working with designers in and around the city to create the programme of events, workshops and exhibitions to take place inside the Keiller Centre. As part of the festival, a live production space will be created in which the process of design can be clearly seen and explored by visitors. Designers will be commissioned to create products on-site with the items going on sale at the festival and in other retail spaces around the city. Ryan McLeod, a designer with Agency of None, said: “We are looking forward to basing Dundee Design Festival in the Keiller Centre in the heart of Dundee city centre. “We want to engage an area of the city that is in danger of disappearing but has many positive memories from the past, somewhere we can prototype a new use and identity for the space and leave behind a positive change in the city. Caroline Warburton from VisitScotland added: “Dundee’s creative credentials were cemented when it earned its status as a UNESCO City of Design, the Dundee Design Festival is a natural extension of that title, a celebration of the city’s culture and creativity.